Who doesn't love to learn about penguins? There are so many interesting facts to learn and cute songs about penguins! This is an awesome activity that can be easily adapted to children of various ages and needs. It is also good for differentiation instruction. It's a great way to incorporate technology into the classroom. *****This is a great product to try If your school/district blocks or filters certain internet sites. If these QR codes work, then all of our products should work without any problems. The videos are from YouTube, but we have funneled them through the safeshare site so that students only see the video from the QR code. Safeshare keeps the videos clean from commercials, popups, and won’t allow students to surf the internet. When the QR code is scanned, students then hit play. 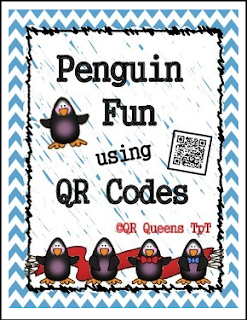 Check out our QR Codes (made in safe share) to explore the world of penguins! Just scan the QR Codes on the task card using any device with camera capabilities (such as a Smart Phone, iPad, iPod, etc.) and watch your students immediately become actively engaged while exploring and learning interesting facts about penguins via songs and stories. Directions for Use: Our products are made into two formats. 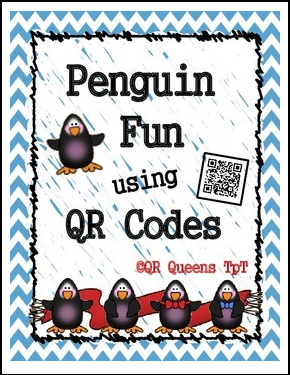 We have a task card that QR Codes can be scanned using rear facing camera devices and we have QR Codes made into individual cards that can be cut apart to use with front facing camera devices. The individuals can be backed with construction paper or pretty scrapbook paper to fit the theme; these can also be placed around the room. Print, laminate or place in plastic sleeves for notebooks. You can also hook your device up to your smartboard for the whole class to view. After viewing the QR codes (made in safe share), the students can be directed to the choice board activities and word bank to enrich their common core learning experience. These activities can then be easily used as formative assessment tools to help you make effective teaching decisions! If you have any questions or requests, please use the TpT Q & A tab above. Follow us to receive notification of our new products and sales! Thank you for visiting QR Queens! We have over 100 QR Code products! Here are some of our other products; click each product to view. Bundles are offered at a discounted price!